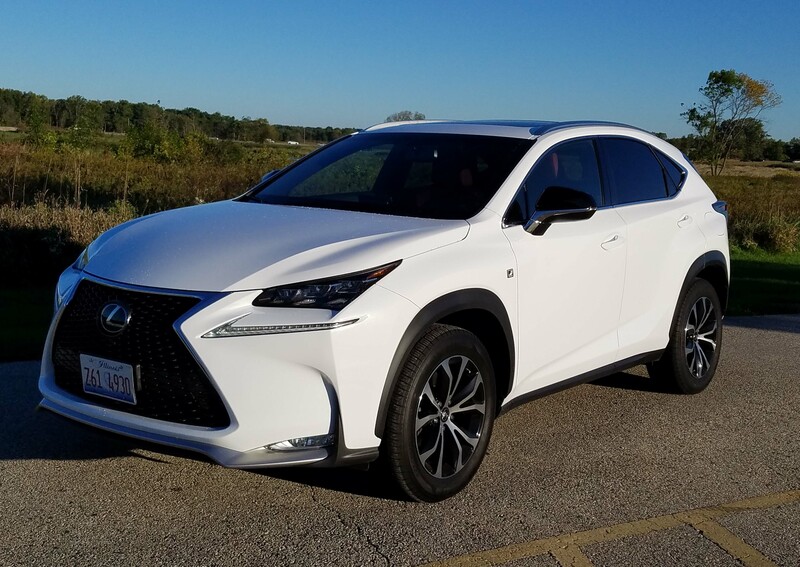 Lexus’ NX 300h that I tested earlier had a 2.5-liter 4-cylinder engine with hybrid system to create 194 horses, but it is down on torque and seemed lackadaisical on acceleration. Gas mileage was better in the hybrid, at 29.9 miles per gallon as opposed to 24.5 mpg this time. The EPA rates the 200t at 22 mpg city and 29 mpg highway. Your call, but I prefer the turbo’s power. There’s a sporty feel to the handling and the NX gives decent road feedback with a more firm steering feel than in the earlier hybrid I drove. Steering is quick and handling aided by front and rear stabilizer bars that help it tool around corners at speed with little body lean. While nimble, the ride is not what you would expect in a Lexus. 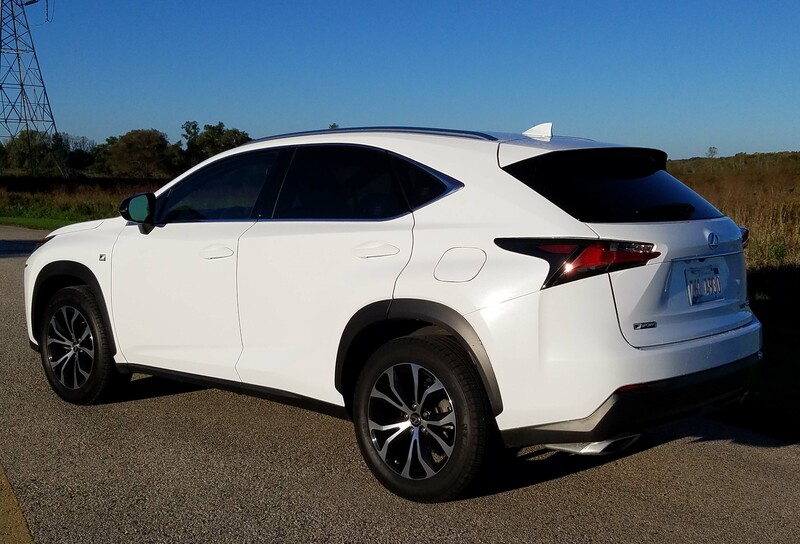 The NX rides on a 104.7-inch wheelbase and is just 182.3 inches long. That’s a couple inches shorter than a Mazda CX-5’s wheelbase. 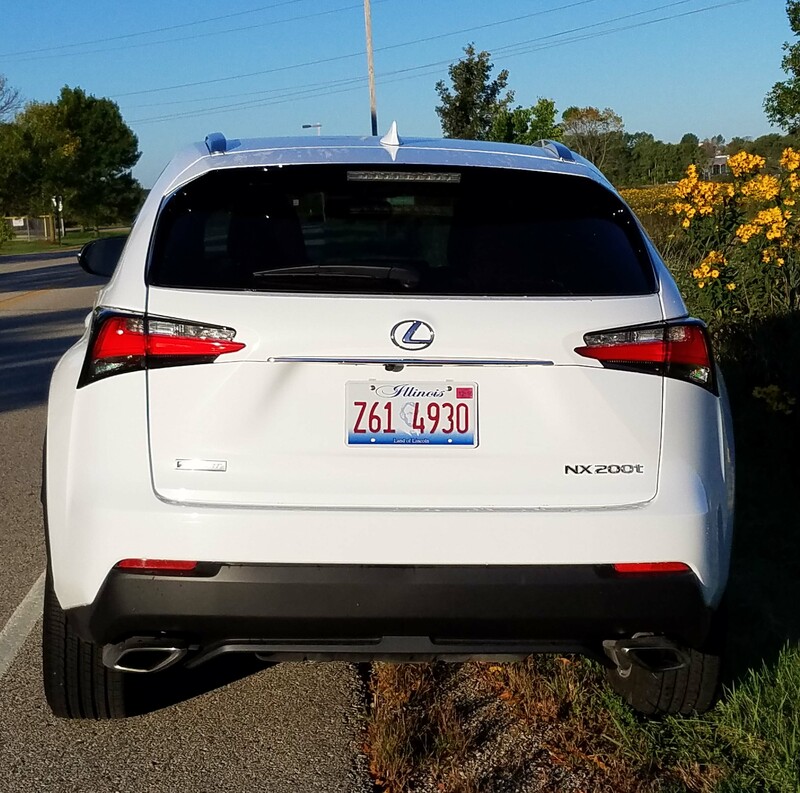 The short wheelbase leads to a choppier ride, and that’s what makes this Lexus less Lexus like than you might expect. Ride is sporty, not always a good thing. It means you feel bumps and pavement imperfections, which is becoming a Wisconsin hallmark. Shifting from the six-speed automatic is smooth and worthy of a Lexus. Plus there’s a knob on the console to adjust the shift points from Eco to Normal to Sport. Eco cuts performance, but boosts gas mileage. Normal was mostly fine, but Sport, as mentioned before, gives you the oomph you’ll want to get onto a highway. I like the NX interior’s looks. It’s quiet and comfortable. Along with the red leather seats trimmed in black, there’s textured chrome dash and door inserts and satin finish chrome around the console and center stack. 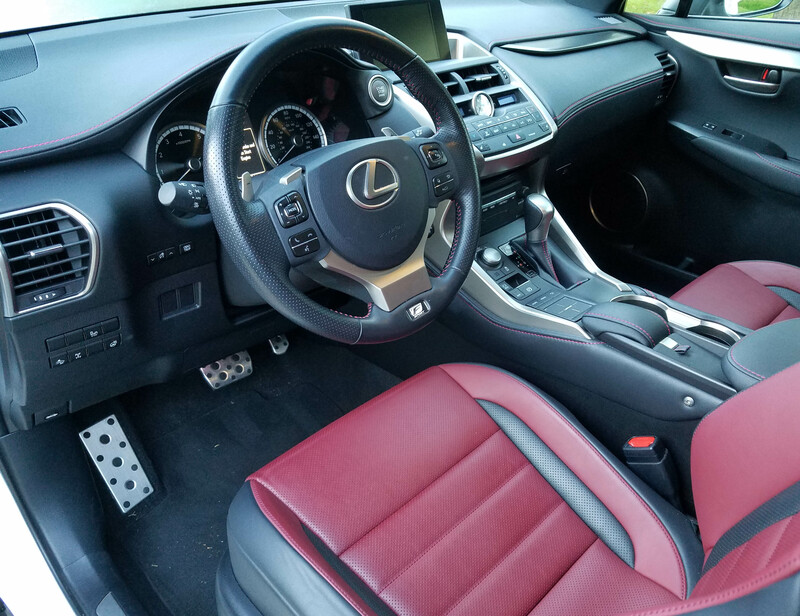 All the leather, seats, dash, steering wheel and door trim features red stitching and looks great! Seats are snug, but pleasantly so with good hip and back support. The earlier test unit’s front seats were too tight, so not sure if those have been widened a bit. I know I have not shrunk. The driver’s seat is powered, as is the lumbar support, and the steering wheel is a power tilt/telescope number. That’s part of the $2,045 F Sport package that also includes a sunroof and three-level heated front seats. Oddly the seats are not also cooled, which I would expect in the Lexus price range. For $150 this one did add a heated leather steering wheel, a worthy option for winter. Rear seats are comfortable and roomy, so four or five adults can ride in the NX comfortably and storage room is good behind the rear seat. The rear seat backs also mildly recline, which can make them more comfortable on trips. This test vehicle also came with a manual hatch, not hard to use, but I’d expect a power hatch at this price. 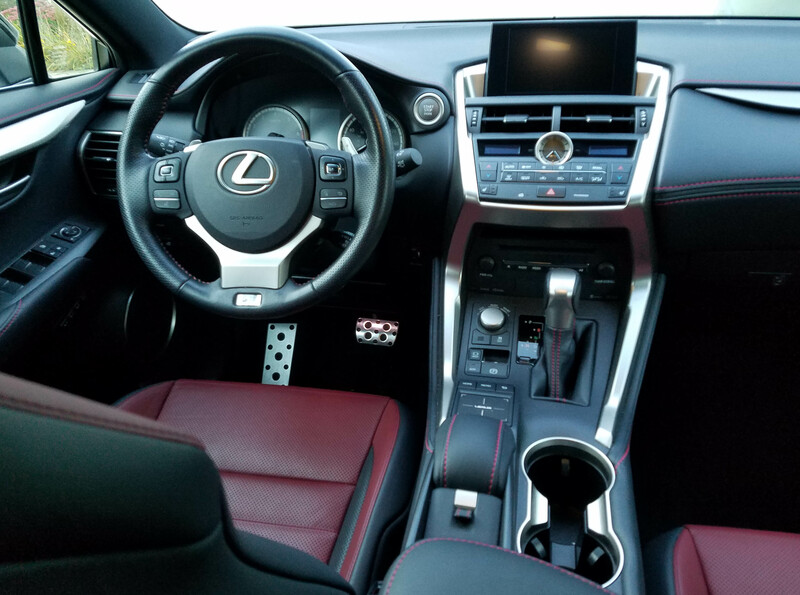 Climate control buttons are large and easy to use, but Lexus sticks with its awkward touch pad on the console for adjusting the radio and navigation system. First, it’s extremely touchy so doesn’t always do as you ask it. Second, it’s so touchy it’s hard to adjust – find a station, different map function, etc. – while driving. This system would be a deal breaker for me. A $1,875 package also adds Lexus Enform, an app suite that includes Yelp, Bing and iHeartRadio and other items onto the large dash radio/nav screen. The package also adds a stereo upgrade with 10 speakers. Other add-ons included LED headlights for $1,160, a wireless charger for $220, and an auto-dimming mirror for $125. I think that should be standard. 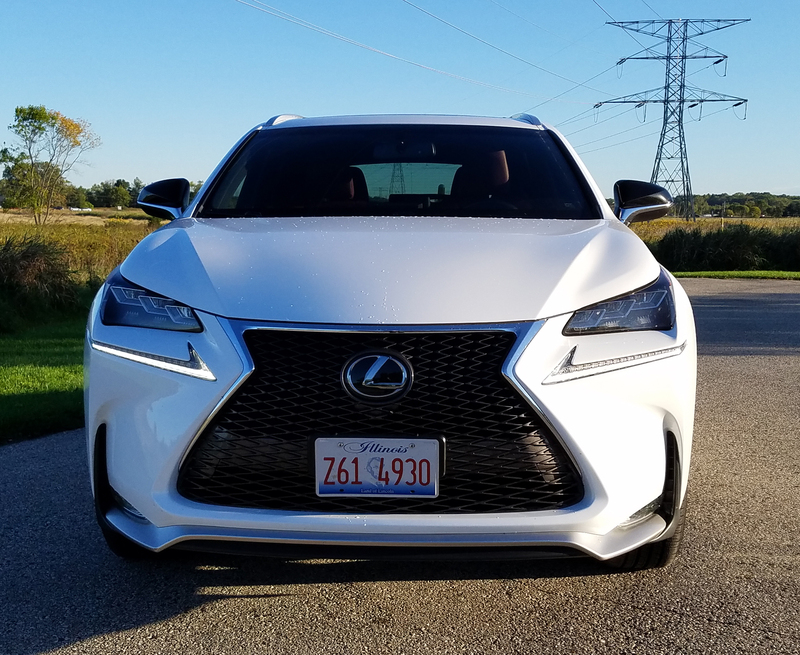 For safety Lexus adds a pre-collision system with adaptive cruise control for $900 and the bargain $660 safety package adds electrochromic outside mirrors with a blind-spot warning system, and a rear cross traffic alert system. The package includes heated mirrors that remember your seat position and that tilt down as you back up. Cost starts at $38,365, plus $940 for delivery. With all its add-ons the test unit was $46,440. A base 200t with front-wheel-drive starts at $35,915 including delivery, while an AWD model lists at $37,315. Going with the hybrid model and front-drive puts the cost at $40,670 and that moves to $42,260 for AWD. 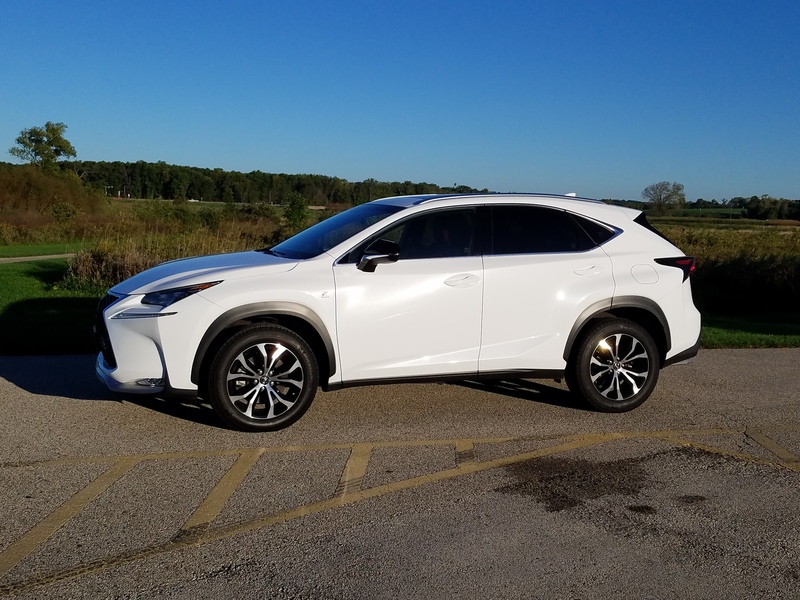 If the NX’s beauty outweighs its stiff ride for you, the 200t with just a few options could come in around $40 grand, making it an attractive (in more ways than one) small crossover. Hits: Sharp-looking crossover, quick handling, quiet interior and good power in Sport mode. Snazzy and quiet interior, good gas mileage, heated leather seats and steering wheel, also sunroof, blind-spot warning and supportive seats. Misses: No power hatch, ride overly firm, hard to use radio/nav with touch pad on console, turbo lag on acceleration.